Delpha Ballard is listed in family records as the wife of Robert Cummins (m. albemarle 1795). Their children include John (1798-1851) my ancestor. 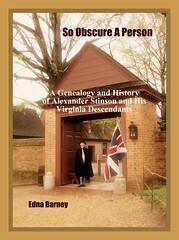 John married Elizabeth Gibson in 1819 and their children include Austin, my ancestor, and Amanda, who married Riley Ballard, a child of Jeremiah Ballard, son of William Ballard (1732-1799) who moved from Albemarle to Monroe in 1793. Oren F. Morton’s “A History of Monroe County” p 304-5 identifies William as the son of William Sr. who came from Scotland and had five brothers who preceeded him to Monroe including Curtis (Esther) who moved to Ohio in 1810. The same source lists Curtis as having sold land on Hans Creek to Robert Cummins in 1796. At some point the Cummins family added a “g” and became Cummings. Can anyone identify Delpy Bowling as the child of John Bowling and Mary Ballard who married in Orange Aug 22 1773 according the marriage record indiex 1624-1915 available in the LDS Family History Centers? The William referred to may have been Mary Ballard’s brother. and Delphia Ballard would have been Mary’s sister, and Delphy’s aunt. Their father would have been Phillip Ballard. I am searching for information about my ancestor, Delphia Bowling who married Robert Cummins in 1795 Albemarle Co, VA. Research seems to show that John Boling/Bowling and Mary Ballard moved from Orange Co, VA and settled near Mary’s brothers in Madison Co, KY, and that John Bowling and Mary Ballard had sons, Joel Boling, Daniel Boling, and Benjamin Boling. Benjamin had a daughter named Delphia Boling/Bowling. The name Philadelphia seems to occur frequently with the BALLARDs of Virginia. I don’t know whether Philip and Nancy BALLARD had a son William, however I have seen reference to a deed that connects them to a William BALLARD: Orange County, Virginia Deeds: 14 April 1787 from Philip Ballard and Nanc to William Ballard 100 acres. Have you researched to see if Philadelphia BOLLING could be a child of John and Mary BOLLING, Mary being the daughter of Philip and Nancy BALLARD? The dates seem to fit, as they were married in 1773, and Delphia was married in 1795, which would give Delphia a birthdate of about 1777. Philip Ballard of Orange County, married to Ann Johnson, was the son of William Ballard and Philadelphia Lee? 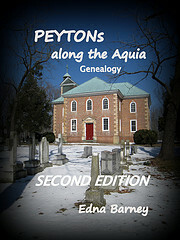 or Ludwell?, he the son of Col. Thomas Ballard of York County and Speaker of the House of Burgesses. Col. Thomas was the son of Thomas Ballard, who came to Virginia with his father Henry but returned to England, leaving his father and son Thomas. That Henry also had a son William who was the Immigrant in Lynn, Massachusetts, whose family is well documented. Speculation abounds as to the origins of Philadelphia as to whether she was a Lee or a Ludwell. This William was the 3rd son of Thomas, the others being John (d. ca. 1691), Thomas (d. 1711) and Bland. Bland moved early to Spotsylvania and then to Orange County, followed by Philip. Philip Ballard had numerous children, one of whom was Delphia. They also had William Ballard, married to Elizabeth Steppe, and Philip Ballard Junior. They had about 12 children in all (my paperwork isn’t at fingertips as I write). The best genealogy written on this family is “The Intrepid Ballards”, written by Meriam Ballard-Pringle, published, I think, in 2003. There aren’t many copies, but one is located at the DAR Library in Washington, DC. Haven’t seen one at the Mormon Library in Salt Lake City yet. Another account of the family from Philip and Ann Ballard is Volume III of “Orange County Families”, also at the DAR Library. There is another book that is excellent from William Ballard (of Orange County, VA) on down to his children. The author incorrectly states that William was the Immigrant and came from Lanark, Scotland. That is totally wrong, and she states that Philip, actually William’s father, was a brother. However, the rest of it is accurate. That book is by Margaret Ballard and is entitled, “William Ballard and His Descendants of Monroe County”. Philip Ballard married Mary Yures had a son named Oren in 1791. Oren married Margaret Mayhew Hillman (1791) in 1811. Oren died in 1875 and Margaret in 1879. They are both buried in Maplewoood cemetary in Findlay Ohio. Philip Ballard and Ann Nancy Johnson had 16 children if my file is correct. I also show John Cummins as having two wives. Elizabeth Gibson and Nancy Broyles. Yes, thatmatches my information. John Cummins (or Cummings) was the child of Robert or Robin Cummins or Cummings and Delphia Ballard, according to Margaret Ballard in “The Intrepid Ballards”. I am not really into geneology, but in 1985/86, an Air Force Captain Greg Ballard at Altus AFB OK showed me a copy of the Ballard family history going back to England/Scotland in the 14th century. It showed 3 brothers landing in the US (1600 or 1700’s)- 2 stayed in NC and 1 went to Oregon (his family). The chart showed the Oregon side of the family complete to date. The line from the other 2 brothers ended with a Phillip Ballard in Monroe County, West Virginia in 1921. My grandfather, William Howard Ballard Sr (at age 78, died in 1958) was from that area. I’m not sure how he tied in with the Monroe County Ballard’s. He married Hattie Dolan from Rock Creek WV. She died in 1993 at 104 yrs of age. Their 3 children (Elizabeth, Reba, Willian H Jr) are all deseased. To my knowledge, the Ballard’s from that line are: William H, Jr (my dad, died in 1999), my sister Judy in Auburndale FL, a step brother, Jimmy Erwin in Fontana CA and a step brother, Tommy in Cleveland, OH. Jimmy has 2 children (all assumed his mother’s maiden name), Tommy has 5 children with the Ballard name. About 2 months before my Dad died, my sister and I sat down with him and charted all that he could remember from both the Ballard and Dolan families. My sister has that chart. I will contact her to see if its still in her possession. Looking for Ballards of Lynn, MA. Specifically the parents of Jane ballard who married John B. Hitchings and The parenst of Sally Ballard, who married Jospeh Dampney in Saugus, MA. You can start by finding Frank Ballard in the census. You can then trace his family back to the 1850 census very easily if they are in the U.S. I have a Phillip (Philip) Ballard arriving in Clark County Kentucky sometime before 1799 when he first purchased land on Four Mile Creek. I believe him to have been born sometime around 1750 give or take 10 years. He died there in 1824. His children were Sarah (Sally), Elizabeth, Lucy, John William, Elzeffy, and William. I cannot find proof of his parents. He served in the Va line and held the rank of Maj. during the Revolutionary War. There was also a Bland Ballard listed in the same Clark County census. Possibly a brother or cousin. I suspect that he is the son of Bland Ballard, Sr., but Bland’s will does not list him as a son. Could he be an illigetimate son or possibly just left out because he was no longer in Va? I’ve compared his information with that of other “Phillip Ballard’s” with known ancestry of the time and have ruled them out as prospects. With him naming two of his sons William and John William I’m drawn to think him close to a William Ballard. Who knows? Hopefully someone out there. Hi, I was wondering if anyone ever found more information regarding Philip Ballard of Clark County, Kentucky. He died there in 1824. As hard as I’ve tried, I just can’t find any definitive proof, or even an educated guess, of his parentage. He just seems to have popped up from thin air. I have not received any new information from anyone. My best educated guess, is that he is one of the three Philip Ballards of Orange Co Va listed in the 1782 Census. They are called Philip Ballard, Philip Ballard Jr., and Philip Ballard The Younger. There is also listed a Thomas Ballard Jr, Elijah Ballard, and William Ballard. Records show the last year for a Philip Ballard on the tax list of Orange Co Va was 1795. Maybe this is because he had moved to Ky. I would LOVE to pin down his parentage. I realize this is a pretty old email chain regarding Philip Ballard of Clark County KY, but I just recently ran across it. I am descended from this Philip, through his son John William, and have also run into a dead end regarding his parentage. I agree that he was probably the Philip on the Albemarle Co, VA, head of household list from 1785, who MAY, in turn, have been the “Philip the Younger” on the similar list for Orange Co. from 1782, but that’s as far as I’ve been able to document so far. I’m wondering if Shelly or any of the other respondents on this chain had any more luck since these postings were added. Shelly, according to my reading of NSDAR records, Bland W. BALLARD of Shelby County, Kentucky seems to be the son of Bland BALLARD of Jefferson County, Kentucky. They both served as soldiers during the American Revolution. The younger BALLARD died on 5 September 1853 and his Pension Number is S*W20655. I have no information of Philip BALLARD of Clark County, Kentucky. I am seeking a living female descendant on the line of Nancy Ann Johnson who married Philip Ballard. I’m stuck on my all female line and have DNA Tested. I need a descendant of Nancy through an all female line to test and am willing to pay for the test. This will prove I have the correct lineage. If anyone can bring down a female line that would be wonderful. The one from which I think I may descend is Philip and Nancy’s daughter Mildred who m. Jesse Watson, but any female lineage will work. I’m looking for an all female line from Millie (Mildred) Ballard, dau of Philip Ballard. I’m at a brick wall with Mildred Ballard who m. Jesse Watson and David Craig. I think I could be descended from Jesse’s child who was born about the time he died in Madison Co, KY. Millie returned to Albermarle Co, VA. As I don’t think she had any girls that I can track, I’m hoping to find an all female line from one of her sisters. I have tested my mtDNA and the only way I can get through this brick wall is to test an all female descendants of a dauther of Philip Ballard’s wife. If I match that person, I will know this is my line. I will pay for the test, and as I give presentations on the subject, I can fully explain all about Genetic Genealogy. Sometimes this is the only way to break down a brick wall and I’ve had it for nearly 40 yrs! Please see my URLs below. I’ve been searching my Ballard line with no luck, all I can find is that my g.grandfather was Charles (charlie) Dow Ballard and he was from Alabama. I’ve been told his fathers name was George and his mother was Mary Rollins. If any body out there as any info it would be greatly appr. Good Luck! It sounds like Mission Impossible to me – tracing a female line back that far. I know of NO female children for Mildred Ballard Watson Craig. In fact, I have never found any Watson children for her. Even her supposed sisters had no daughters that I know of. Everything after her marriage to Jesse Watson seems to be legend and lore until she shows up in Albemarle County when she married David Craig. I am not a Ballard researcher, so I hope that someday, someone will clear up the lineage of this family. I have been able to trace my husband’s line back to John Marion Ballard, born 1837, in Greenville, Green Co., Tn but have not been able to go any further back. This family is migrated to Saline Co., AR around 1870. Can anyone help me back track any further? Sources please. I have a Robert Scearcy or Searcy or Scarsey son of a Robert and Mildred or Millie Ballard. I also have Millie as being daughter of Ann Nancy Johnson, but I have two different fathers, one is a John Ballard and one is a Philip Ballard. I am looking for some kind of varification of ancestory. If anyone has any info they can help me please email me at Pashionada@live.com. Does anyone know a living female from the ALL-female line of Phillip Ballard’s wife? I would like to have them DNA test (my expense) as I believe my 4th great grandmother, Frances Watson (beware…there were at least 5 others at this time), b. ca 1788 Madison Co, KY and returned to Albermarle Co, VA by age 1. As no solid records have been found on her parents, although her marriage record states her father was John Watson (There are 5 John Watsons al with a Frances or Fanny, but none are mine…so did the clerk make a mistake? ), although he apparently was dead when she married Dabney Ellis in Albermarle Co. I am now suspecting that Jesse Watson who m. Mildred Ballard, a child of Phillip Ballard may have been her mother as Jesse died leaving an oral will stating all to his wife and unborn child. I know Mildred married a few times, but I can only find sons from her. SO…I have to go to her siblings or mother for an all female line. Can anyone help? I am very interested in the information you have about Millie Ballard. Some say she married John Boling, however a marriage record says that Mary Ballard her sister, married John Boling and I believe they were the parents of Delphy Bowling who married Robert Cummins..
Mary Ballard’s parents, Phillip and Ann Johnson Ballad may have raised Delphy as their own child after her father John Boling died while in service during the Rev war. John Boling while in Rev War service. I have read the same articles about the Ballard family which Ballard researchers have accepted as proof, however, I do know that sometimes older family traditional genealogy research can be proven wrong by the finding of newly disclosed information taken from court documents. I hope to find other researchers who also believe Delphy Bowling who married Robert Cummings, was the child of John Boling and Mary Ballad. Descendant of Delphia Ballard and Cummings. I have limited info on the Cummins(gs) line only as it relates to my family. My goodness…I sure do not get around to check this site much! So sorry!!! I am greatly interested in finding an all-female line from either one of the daughters of Ann Johnson Ballard or from one of Ann’s sisters. I am trying to break through my dead-end. I don’t have any solid info on Ann. So sorry. (Editor’s Note: email address removed for safety concerns). I would appreciate any information about Robert Cummings and Delpy Bowling that you would like to share. I am a descendant of their son Charles. Still hunting for an all-female descendant from Ann Johnson who m. Philip Ballard. You can email me directly by googling my name as I’m all over the next and probably have my email somewhere there. It is the hevanet.com one and not the teleport. I too am looking for DNA and info about the Ballard’s of Orange co, VA. I believe you were interested in finding more info about Milly who married Jesse Watson and I am searching for proof about her older sister Mary who married John Boling/Bowling. I am sure you know, as do I, that Milly did not marry John Bowling as some early researchers claim nor was Milly the mother of Joel Boling/Bowling. Milly was much younger than Mary. Mary Ballard married John Boling/Bowling in Orange Co, VA in 1773. John Boling/Bowling died in the Rev War in August 1777. Mary and John probably had 3 or 4 children by the time of his death. Delphy’s age in 1810 fits within the time frame that she was born in 1774. In 1833 Polly/Mary Boling appointed Robert Cummins of Monroe Co VA to try to get her a Rev War widows pension or compensation. I believe Delphy is the child of Mary Ballard and John Boling/Bowling but was raised by the Ballard family or may have been indentured out to William Ballard to raise. He witnessed her marriage record and remained a close friend of the family in Monroe Co, VA.
My DNA connects to Delphy and Robert Cummins and to the Ballards but there is no way DNA can prove that Mary Ballard was her mother and not Delphy’s sister as researchers claim. Researcher have the family line of Delphy and Robert Cummins screwed up badly. If you learn anything new about Milly and her family I would appreciate it if you would share it with me..
Due to the distance back in time, anyone and everyone who can trace an all-female line down from one of the daughters of Phillip should take the full mitochondrial DNA (mtDNA) test. If we match (I have taken one), then we know this must be our line. The autosomal DNA test won’t help on this as it is so far back in time. I would dearly love to hear from anyone who can trace an all-female line from one of Phillip’s daughters to themselves. The only new information I have found about Delphy Bowling is according to DNA matches. It appears from DNA matches that Delphy had a son William who was born before she married Robert Cummins, and William is not a child of Robert Cummins. It would be interesting to learn who the father of Delphy’s child William is and what the circumstances were. Was she an indentured servant as some researchers have said? She apparently traveled from Albemarle Co, VA where she married Robert Cummins, with him in the same group as Curtis and Larkin Ballard to Monroe Co, VA. to settle. She definitely has Ballard DNA. Where did they live in Albemarle Co, VA? Any info is appreciated. My husband is a descendant of Philip/Phillip Ballard of Clark County, Kentucky through his daughter Susanna who married Joseph Baker. I’ve been searching for his parents for 30 years, but no luck. The only clue I could find was that a James Ballard was living in next county, Montgomery, and that is where Susannah and Joseph married. Perhaps this James had a middle name (Philip). Since Montgomery was formed from Clark County, it’s possible that James never moved, the county lines may have moved. I’ll keep searching, but this has definitely been my brick wall. have you or anyone have information on a Dudley Ballard from Virginia born 1740 or 1750. not sure if he is from Virginia but he was in the revolutionary war. and it was a Virginia regiment.